Throughout history people have used the puppet theatre to tell stories, often about demons and gods as well as ordinary people. Frequently the stories tell about good and evil - they are trying to teach something as well as entertain. 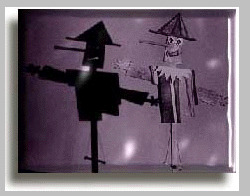 Today puppets are still used to teach people. In Togo, for example, puppet shows are used to teach people about how they can avoid getting AIDS. In countries where not everyone has a television or radio, and because it is not necessary to know how to read and write to understand the message, puppet shows play a powerful role in communication. Project 1 : In April 1996 Grade 6 visited the Tropen Museum in Amsterdam and studied puppets from around the world. We saw hand puppets from the Netherlands, Turkey and India; string puppets from India, Burma and Togo; and beautiful shadow puppets from Thailand and Malaysia. Below you will find four student reports from he Puppet Project of 1996. Project 2 : In October 1998: Grade 5 students completed a project on mythical heros and heroines. As part of their studies they created puppets to illustrate some of their favorite personalities. Here is some of the student work from the Puppet Project of 1998. If you are interested in more information on this topic we suggest you also visit The Puppetry Home Page or follow some of the other links we have listed below.